The IHG study found unfamiliar surroundings and poor lighting were impacting positive sleep. Four in five respondents (80 per cent) in a new study commissioned by InterContinental Hotels Group say they struggle to sleep when away from home. Release to coincide with World Sleep Day, the report noted that business travellers lose around 58 minutes of sleep each night when away from home, averaging five hours and 17 minutes of sleep each night. 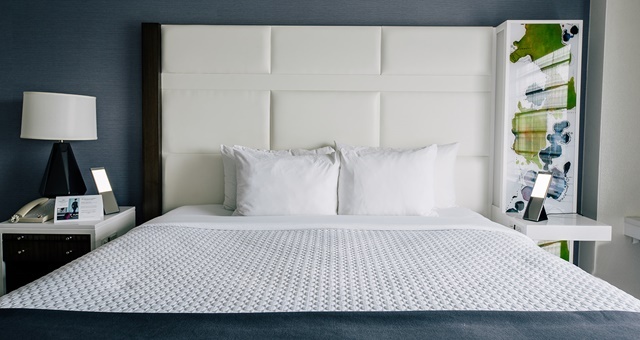 The unfamiliar environment of a hotel room compared to home, unfamiliar noises and the demands of working late also contributed to the disturbed night’s sleep, the study found. Two-thirds of respondents to the study said they felt more tired when away from home, with nearly half acting to improve their sleep by either listening to music or watching television before bed. The study results were also revealed in line with the launch by IHG of its new circadian lighting pilot program, which will see the rollout of the portable Journi Mobile Task Light, installed initially at the Crowne Plaza Atlanta Airport. Guests will be able to adjust the light from the blue-enriched white spectrum used to wake the brain in the morning to the blue-depleted spectrum in the evenings. The program – a partnership with the Healthe by Lighting Science Group – sees LED lighting used to regulate the body’s circadian rhythm, which affects sleep, hormone levels, body temperature and metabolism. The Journi lighting system works to help a person wake up gradually in the morning and then to settle into a warmer-toned light in the evenings which will enhance sleep. It is unclear at the moment whether the pilot program will be rolled out on a wider basis beyond the US and into other parts of the world, including Australia. “Light can also be a stimulant, directly alerting the brain, or promote sleep before bedtime, depending on the spectrum and intensity of light exposure,” said Harvard Medical School and Healthe Advisor, Dr Steven Lockley.